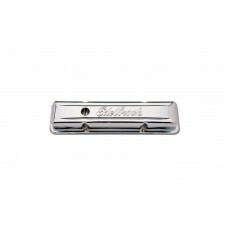 Edelbrock chrome signature series valve covers add good looks at a great price. For 1959 and later Chevrolet small block with perimeter hold down valve cover fixings. Low profile – will NOT clear roller rockers. Matches air cleaner EDEL1207, EDEL1222. For matching breather use EDEL4405. Overall height 2.8". Price is for a pair.